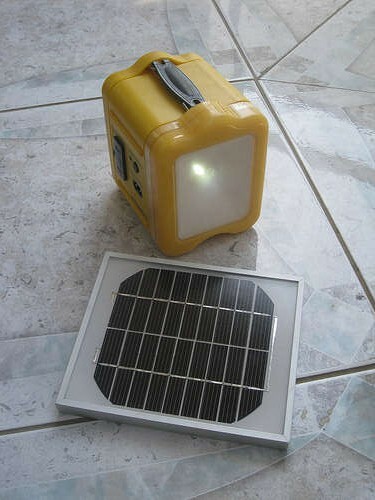 A report written for Digital Campus which reviews a number of solar PV lanterns with a view to deployment in Ethiopia. This report was written to look at using solar PV lanterns to recharge smart mobile phones in remote locations. Following on from this report, Digital Campus have been using both the D.light lamp and the ST2 solar lamp/charger from SunTransfer. Apparently the ST2 lamp is preferred by the workers in the field (health workers in remote areas of Ethiopia) as it has a replaceable relatively large lead-acid battery. The ST2 lamp from SunTransfer. 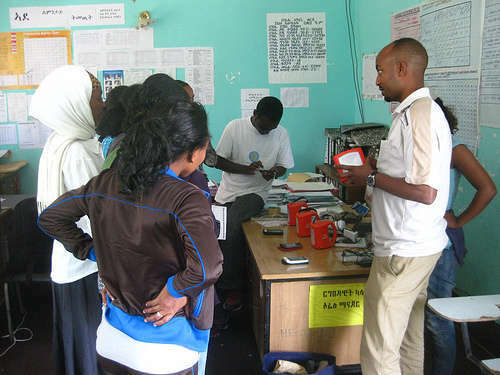 Health workers being shown the d.Light used to recharge smart phones. I will try to keep up to date with long-term information regarding how long these lanterns last ‘in the field’ and post any information here. Recently I got a first prize for this entry into the instructables green-tech challenge. 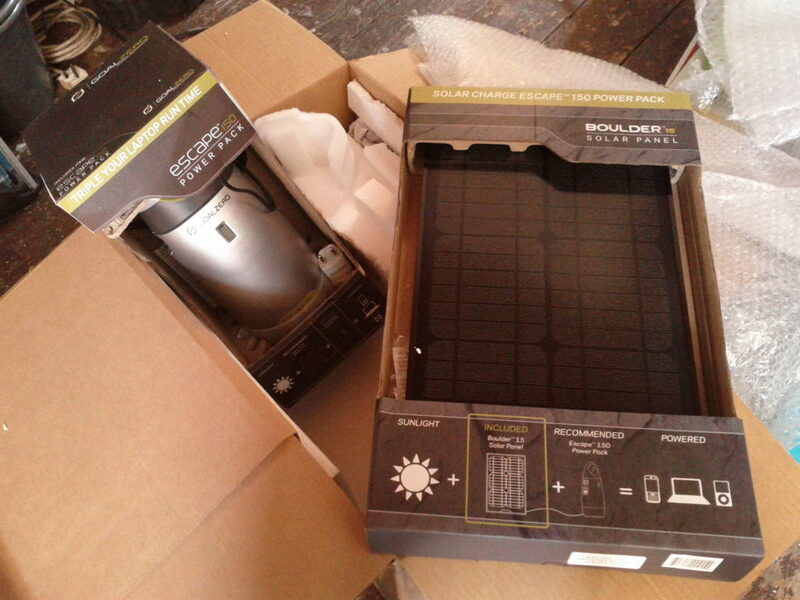 The prize was a GOALZERO Escape™ Scout 150 Power Pack and a GOALZERO 32101 Boulder 15 Solar Panel. The prize was offered by Radio Shack (an American electronic product shop, similar to Maplin in the UK) and retails for £300 in the UK. This is a pretty cool piece of kit – the 15Wp solar panel recharges a power pack which contains a lead acid battery, battery state of charge monitor and a 150W inverter. There are output plugs for 12V (car cigarette lighter socket), 5V (USB) and 240V AC (3 pin mains plug). 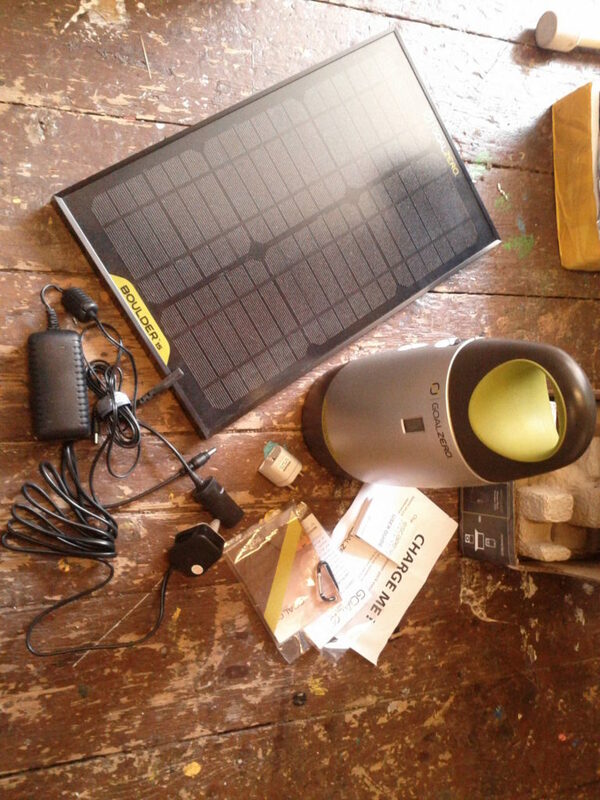 It also came with a mains battery charger for days when the sun has not been shining too much. It feels like it is well built and designed to be robust and rugged. The 15Wp solar panel must be quite efficient as it is the same size as the 10Wp solar panel I used in the off-grid PV system, but produces 50% more output. The un-wrapped prize – it was all very exciting. All the GOALZERO parts from my prize. I’m planning on rigging this system up in my house to make part of my room ‘off-grid’. I have already done this with my solar PV bike trailer, but its always good to compare ideas and products. I will update this page when I have more long-term information on its use. An interesting report on BBC radio 4. Hence it is solar, it saves the energy. It’s Eco-friendly.